» Forum » Tech » Tech: Generic » I Really Need Help! I Plugged a Connector in Wrong! » I Really Need Help! I Plugged a Connector in Wrong! I Really Need Help! I Plugged a Connector in Wrong! I was doing some board work, and got a little excited and accidentally plugged the coin door diagnostics molex connector slightly shifted over on the pins. I blew the Solenoid fuse, should I replace it then turn on? I corrected the misplaced connector too! Does anyone know if the incorrectly placed connecor would cause a problem like this? I want to make sure it isn't something else, Thank you! Whatever happened has already happened. So yes, after correcting it, put in a new fuse and see what happens. However, keep your finger on the power button. If any coils pull in and lock on, shut it back off quick because you took out a transistor as well. We've all done it. Sometimes you gt lucky and it just popped the fuse. Other times, well it is what it is. I plugged it in! The transistor is fine but when ever I turn it on, the displays are all messed up and the game will say random words.. what has happened?! You need to post a lot more info if you want help from the tech guys here. Game? What did you work on (CPU, audio/visual, driver board, etc), did you unplug any ribbon cables, plugs etc. I'm confused! I really want to fix this! We are confused as well without more information. The game is Firepower. I worked on reflowing the top pins on the CPU. These pins are for the displays primarily. Yes, I know reseating connectors doesn't fix anything but I just wanted to fix my displays that were a little scrambled because of cold solder joints. I had get the whole board out (removing the ribbon cables attached to the boards) and I separated the big molex connector in the middle for convience. The first time I put the boards in, I accidentally put the top connector for the coin door diagnostics in a little off (corrected that) and I blew a Solenoid 28+ fuse and I haven't replaced it just yet... turned it on and the displays were all weird and garbled and the voice was saying random words..
Do you all think this issue occurred from the connector being misplaced in the first place or could it be some other connector like the big molex connecting the two boards? It looks like I put it in ok! Check the solder you reflowed. You may have some points that are shorting now from that work. Gotcha, want me to send a picture? Yes, post a picture. Is that the only work you did? I didn't put enough solder? Can't tell without a picture. Is this the problem?? 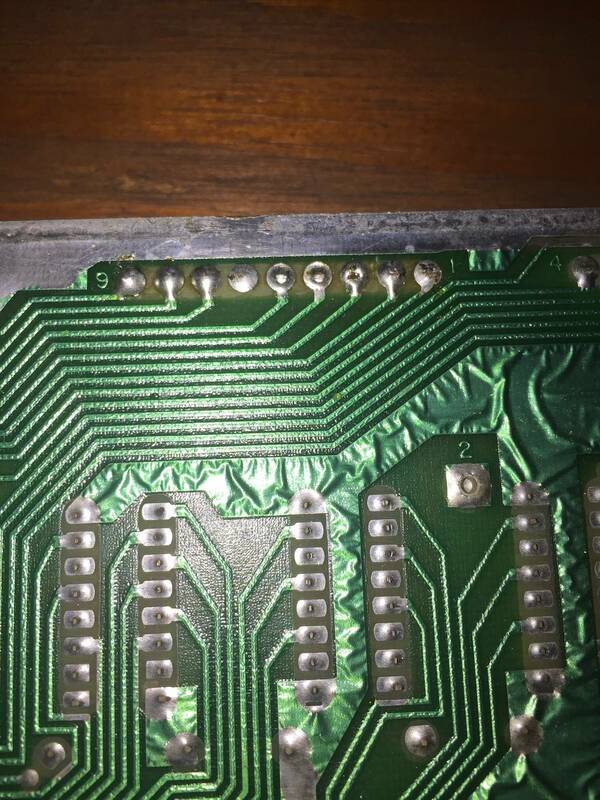 How should I fix it when soldering? Thanks! 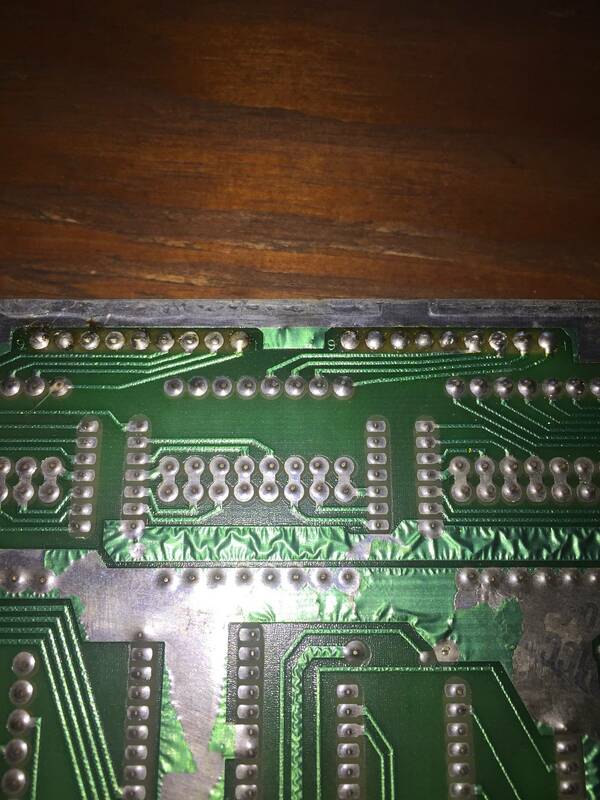 Solder job looks fine from what I can see. I have seen far worse, and far worse that works just fine. Sadly, your problems are likely elsewhere. Did you say the displays did not have this problem before you incorrectly installed the plug? Problem with soldering to those old connectors, you just may not get a good solder bond, unless you desolder and scrap the legs a bit and the resolder. Or just install new connectors. Yes, this seems like an issue still. I don't know williams systems well enough to guess what you could have fried by putting the plug in shifted one over. I would look at the wiring diagram and see what the "power" wire(s) were on the connector and figure out where power went that it was not supposed to go. I don't think misconnecting data lines would matter. It is the power lines, especially the high voltage display power that may have been sent to some chips that are only made for 5 volts that I am worried are cooked. Sometimes though, I do see the wired connectors as issues and have to repin the ends of the wires. Can you move the wires a bit when the game is on to see if it clears up any of the displays? Gotcha, I am going to put the boards back in once again because I just reaoldered some joints that looked a little strange. Do you know why the game would be speaking when it's not supposed to? During game play or just in attract mode? What are the sounds doing when you play a game. Which connector and which direction is did you install it wrong? What connector number is it? You may have sent a higher voltage to a lower voltage line. Likely displays and sound issue likely are related. Ah, makes sense. It is connector number 7. What do you think I should check? I would have to locate the drawings and review. Likely someone else will have some ideas before I can get a chance to review. I just wanted to help get all the information as possible to help you get this repaired. Have any other games with this board set? I even labeled my connectors and still screwed up I'm going to have another repair guy with more experience to help me out... It should be ok! Thanks everyone for the help though! can you elaborate so if someone does this in the future they can know where to start checking. I'll post something this weekend when I talk to my repair tech. I usually call him if there's a problem that I am stumped on. I'll ask him this weekend about what happened, he came when I wasn't home but he fixed it very quickly haha. I'm assuming he started by following the wires of the incorrectly placed plug and went from there. Will post more soon.